Accent the interior design of your living room or family room with the casual yet idyllic style of this end table. The clean uncluttered lines are a refreshing change and enhance the natural beauty of the solid maple, creating a piece that is as durable as it is stylish. The top drawer is accented with brushed nickel hardware and is perfect for storing remote controls, TV guides, or other reading materials. The bottom shelf and the table top can serve to display your favorite collectibles or picture frames. Place a finishing touch to your home with the refined style of this end table. The Loft End Table with 1 Drawer by AA Laun at Town and Country Furniture in the Hamburg, Buffalo, Lackawanna, Eden, NY area. Product availability may vary. Contact us for the most current availability on this product. 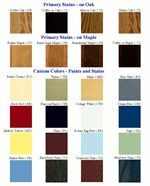 Wood & Finish Choose your Custom Colors, stains or paints, and the finishing options all stain, all paint, or various combinations of stains and paints, standard or deluxe. The final creation is then truly a one of a kind selection, finished by our skilled craftsmen. Finish & Paint Options Choose from 4 Primary Oak Stain Options, 4 Primary Maple Stain Options, and 16 Custom Paint and Stain Options. Handles & Hardware Brushed nickel pull hardware. Case Detail Corners and edges will be softened and slightly distressed, providing a warm and comfortable "time worn" feeling, while making each piece an original work of art assuring you many years of enjoyment. Drawer / Shelf Construction English Dovetail Box Construction on all drawers. Drawer Suspension Full extension side mounted ball bearing Premium Slides (-PS) which give the drawers a high quality fit and feel. Description: Top Crafted primarily of solid maple, some shelves and rails have maple veneers on solid wood cores. Case Construction Crafted primarily of solid maple, some shelves and rails have maple veneers on solid wood cores. The Loft collection series features the latest trends in fashion and finish to more casual styling with a contemporary appeal. Crafted primarily of solid maple, the clean and uncluttered lines are a refreshing change and enhance the natural beauty of solid maple. A number of tables such as the condo cocktail and chairside are scaled for smaller upholstery and urban living. All drawers are English dovetail, accented by tasteful brushed nickel pulls, giving you durability and a beautiful detail. Complete the interior design of your living room or family room with the idyllic tables from this collection and achieve a strong yet comforting feel. The Loft collection is well suited for the Custom Colors program and the Primary Stains to further accommodate your home and personal style. The Loft collection is a great option if you are looking for Casual furniture in the Hamburg, Buffalo, Lackawanna, Eden, NY area. Browse other items in the Loft collection from Town and Country Furniture in the Hamburg, Buffalo, Lackawanna, Eden, NY area.